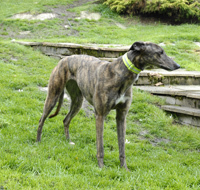 Went to her new home on Saturday 2nd June 2012.
no fault of her own and is again looking for her forever home. 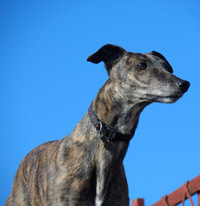 Dee is a beautiful small dark brindle ex-racing greyhound who was born on the 25th April 2008. She is house trained, spayed, inoculated and microchipped. A lovely friendly little girl Dee enjoys love and affection and wanting to please. She walks nicely on the lead, travels well in the car, is fine with children and from what we understand she is okay with other breeds of dogs, but this we are still assessing especially with the small bouncy terriers. 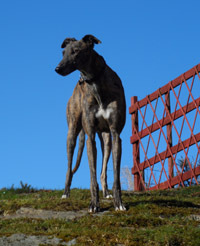 Dee is currently being fostered with Jenny and Stuart and all their greyhounds until we find her a real forever home. As the vets couldn't get Dee in to be spayed until next week and she is reserved for someone we took her to the vets this morning where she had her 1st innoculation, to start things moving. She met other dogs in the waiting room and wasn't interested in them. This morning Dee visited the vets again where she was spayed. While under the anaesthetic the vets shaved some hair from her neck where there was a scab from a nick, which I'm not sure if she came with or not because when we noticed it, it was under her collar. This we removed and put a martingale on instead to allow the area to dry and not stick to the collar as it had been doing. Anyway, with the hair shaved off and it cleaned it will heal quicker. All went well and we collected her this afternoon along with Tam who was also being there having a dental. Back home she lay quietly for a while and later she had a little food before settling for the night. Dee took a trip to the vets today for her second inoculation, thus bringing her inoculations up to date. This morning the family wanting to adopt Dee called in and signed the paper work. 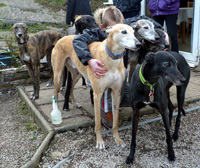 Dee gave them a lovely welcome when they arrived and they commented on how well the mark on her neck had healed. 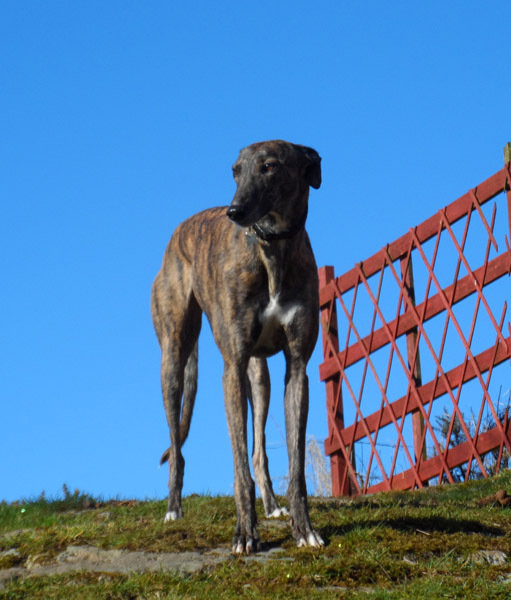 When the time came for her to leave she happily walked to the car, jumped in and off she went to her new home where we hope she will have a long and happy life. We received a photo of Dee laying on the settee this morning from her new owner who says Dee is very well and happy. They love each other to pieces, have lots of walks together, then she sleeps each one off for at least 3 hours! She still follows her owner everywhere as she did when she first arrived and often cries if she is left on her own for more that 20 minutes. This evening we received a surprise telephone call from Dee's owner asking to return her because she kept having accidents in the house. 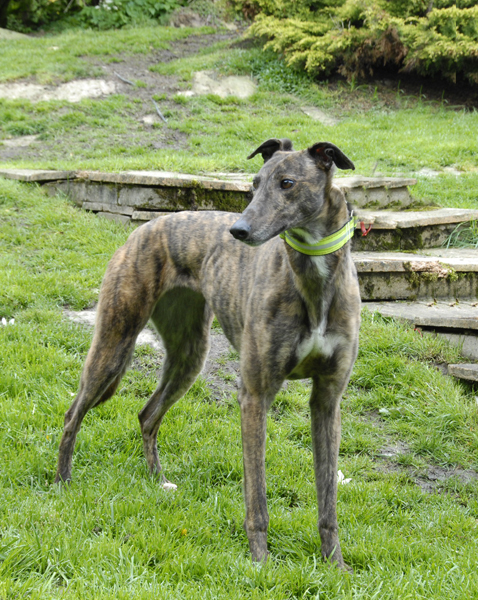 Help was offered, but sadly she was to be returned and arrangements made to bring her back here tomorrow. 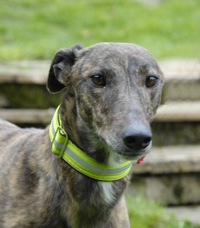 This afternoon Dee arrived back and after her owners left she went in the garden to do her toilet then came inside and said hello to all our greyhounds. Happy to see them all, she soon settled in the living room on the settee and was behaving as if she'd been here weeks! Well, we don't even know we have Dee, she was perfect last night, not too keen on going out last thing to do her toilet, but with a bit of gentle persuasion she went with the others. Settling for the night we never heard a peep from her until she was queueing up with the others to go in the garden first thing this morning. She isn't too too keen on walking on the tiles in the conservatory so a covering has been laid over them until she gets used to them. She eats her food nicely and adores being cuddled. She's a little treasure! 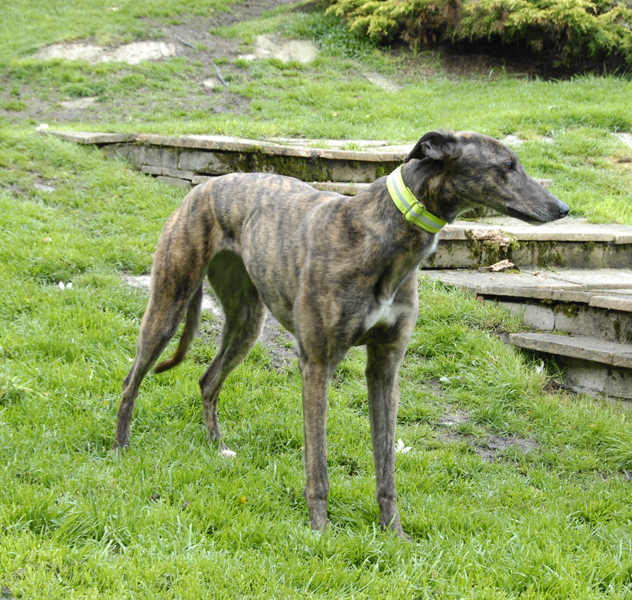 This morning one of our bed and breakfast guests took Dee for a walk with her greyhound. She was smitten with her, but said it was the wrong time to take on a second dog. She thought Dee sweet and commented how lovely she walked on the lead along side her greyhound. She was quite sad to be leaving Dee behind, and Dee wanted to go with her and her greyhound again as they left. 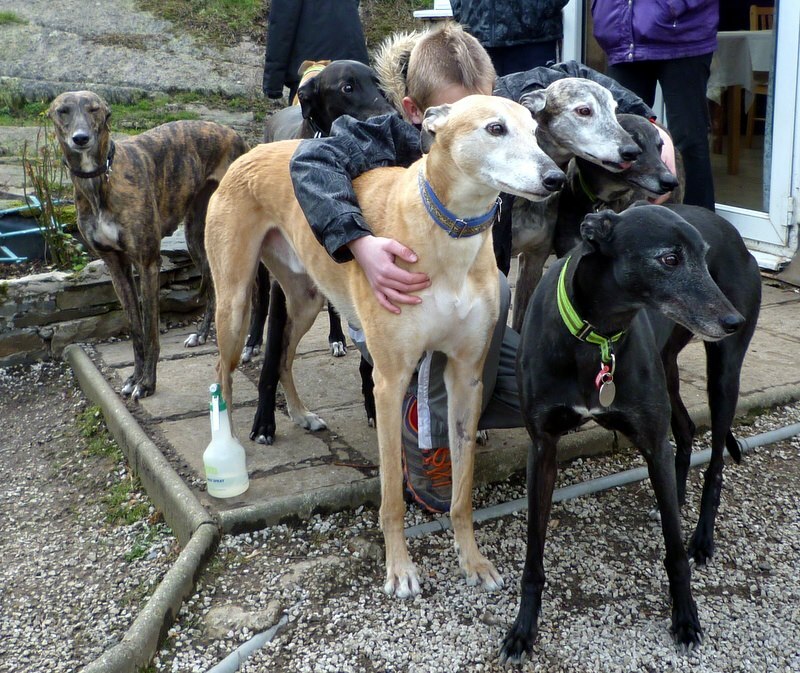 A bit of a cuddle and attention and Dee was back in the house and on the settee having a nap along with the others. This afternoon some friends called in, and to give us a break from being in the house where we'd been most of the time the past couple of weeks because of illness, we went to the pub up the road for an afternoon drink with them. We took Sandy, Solo and Dee with us to see what she made of the pub. She just walked past a black terrier/spaniel type dog by the door as she entered, wanted to say hello to everyone and then quietly stood by our side. The others lay down on the mats, but Dee was quite happy to stand by us and have her head stroked. What a little sweetie Dee is, Stuart has become quite attached to her and calls her his Deedee. 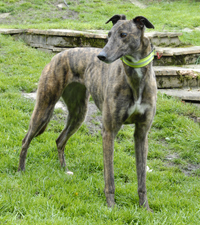 The couple who called in here a few days ago to see Dee with a view to re-homing arrived today to adopt both Dee and Chloe. Dee obviously remembered who they were and gave them a wonderful welcome. All the paperwork complete and off they both went to their new home. We received an email today letting us know that Chloe who was stressing on the journey home, soon made herself very comfortable on both of the “hound only” sofas. She has settled in really well. Dee is not quite as confident, but is relaxing more every day. She likes to sit in the garden when the sun is out—she got a shock yesterday when a goods train went past, and she ran into the house. This morning another train passed but she didn’t bat an eyelid!! They are just so cute—Chloe falls asleep on her back while Dee spreads herself out on number three sofa, which she chose as her own, and Geoff has to sit on the floor! We heard today that Dee (aka The Princess) has come out of her shell over the last couple of months, and now comes to her owners for a cuddle instead of keeping her distance. 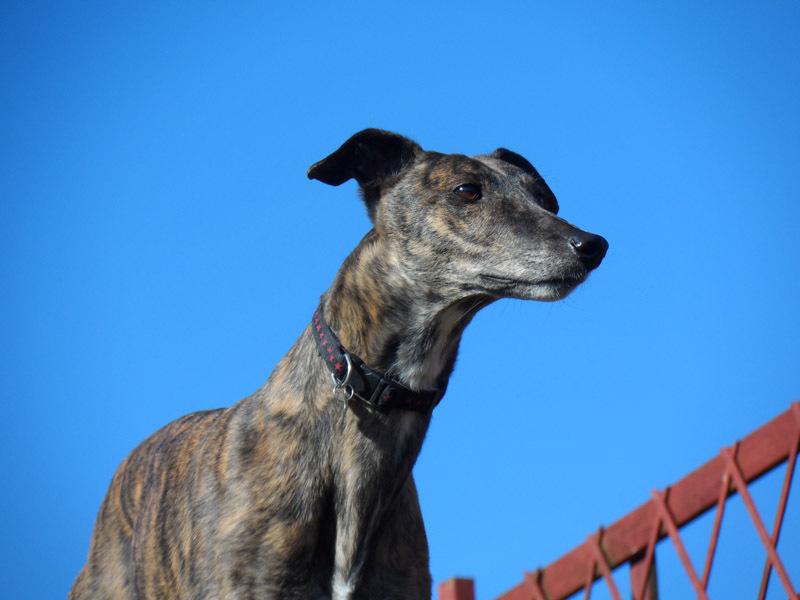 She loves to sleep, eat and run races with some of the dogs who walk on the field behind their house. . . . . and again.